The old adage “if walls could talk” has never had more resonance. When her father Richard dies, Minna, her brother Trenton, their mother Caroline, and Minna’s daughter Amy, go back to Richard’s house to clean it out. They soon uncover more secrets than they had bargained for among the dust bunnies. Lauren Oliver’s page-turner will have you hooked until the very end. The New York Times bestselling author of Before I Fall and the Delirium trilogy makes her brilliant adult debut with this mesmerizing story in the tradition of The Lovely Bones, Her Fearful Symmetry, and The Ocean at the End of the Lane—a tale of family, ghosts, secrets, and mystery, in which the lives of the living and the dead intersect in shocking, surprising, and moving ways. 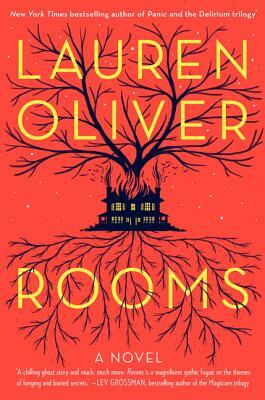 Elegantly constructed and brilliantly paced, Rooms is an enticing and imaginative ghost story and a searing family drama that is as haunting as it is resonant.